Enjoy 2 of Dubai's most visited attractions with the SkiFLY Package for AED 305 only! or Snow Fun at the Snow Park and Indoor flying experience at iFLY Dubai, located in City Centre Mirdif. - Kindly note a refundable deposit of AED 25 per guest will be charged at Ski Dubai counter for the Key Card Access. - For safety reasons children under two years are now allowed in Ski Dubai, and children under 3 years are not allowed in the Slope. - Guests under 14 must supervised by adults 16 years or above. - Skiers/Snowboarders must be intermediate level 2 to be able to access the slope. View Ability Chart. - To fly in iFLY Dubai, guests must be 3 years and above, are not pregnant, are not over 115 kg and do not have of neck, back injuries or shoulder dislocation. - All guests must arrive 1 hour prior the flight time and should be accompanied by Adults 18 years and above to sign the waiver. 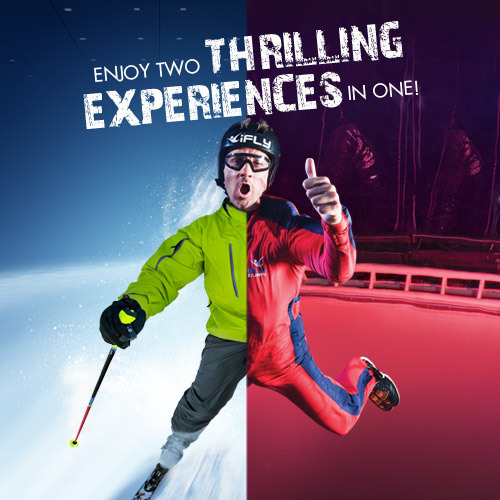 - Ski Dubai and iFLY Dubai Terms and Conditions apply.